Peripheral nerve injury is a serious health problem and it significantly affects the patients’ quality of life. Short gap of the peripheral nerve damage recover very slowly and if the gap between transected nerve ends is large, self- recovery becomes impossible. Hence, repair and regeneration strategies of peripheral nerve injuries have taken a great deal of consideration. In this study, a novel neural scaffold was produced by combining graphene oxide (GO) with polylactic acid (PLLA) to produce electrospun nanofibers to enhance physical, chemical and biological properties of currently used scaffolds. The produced GO/PLLA nanofibers had a tensile modulus of 381 MPa and 10 MPa tensile strength. These values were found to be similar to the mechanical properties of peripheral nerve tissue. Biocompatibility studies also demonstrated that the produced biomaterials contributed to nerve tissue growth. This study shows that GO/PLLA based nanofibers show potential for the regeneration of nerve tissue. Biomaterial selection is considered to be a crucial parameter for the fabrication of neural scaffolds. When biomaterials are chosen for application of neural scaffolds, they must fulfill numerous physicochemical, biochemical and biological requirements. (1-3) Therefore, a wide variety of natural polymers, synthetic biodegradable polymers and electric conducting materials have been examined as potential neural scaffold materials (4,5). In this study, graphene oxide/polylactic acid (GO/PLLA) based nanofibers were produced for production of scaffolds for neural regeneration via electrospinning. Then, GO/PLLA electrospun nanofibers are characterized for their mechanical properties and biocompatibility. PLLA solution was prepared by dissolving PLLA into N, N-Dimethyl Formamide (DMF) at 120 ºC. Chloroform was added and stirred continuously at room temperature until a homogeneous solution was obtained. The weight fraction of PLLA was chosen as 7% to total weight of the prepared samples. In order to prepare GO/PLLA nanofibers, GO solution was diluted with DMF and ultrasonically treated with an ultrasonic homogenization instrument (Bandelin Sonopuls). Then PLLA (7 weight %) was added into the GO/DMF solution and stirred at 120 ºC. After complete dissolution of PLLA particles, the solution was diluted with chloroform and magnetically stirred at room temperature to obtain a homogeneous GO/PLLA solution. Then, the samples were electrospun using electrospinning system (NE 300, Inovenso, Turkey). The solution was fed into 10 mL syringe with 20 gauge stainless steel blunt needle. The needle tip was placed 15 cm below a rotating mandrel collector and the collector was covered with an aluminum foil. The rotation speed of the mandrel was adjusted to 2064 rpm. The solution was fed into the electrospinning process bu a syringe pump at 1 mL/h flow rate. The needle and collector was connected to a high voltage supply and 25kV voltage was utilized to obtain beads free smooth fibers. The mechanical properties of the nanofibers were analyzed by using a Universal Test Machine (LR 5K Lloyed Instruments, UK) at Boğaziçi University Institute of Biomedical Engineering. The nanofiber specimens were cut into 60 mm x 10 mm in length and width. Each sample was placed vertically on mechanical gripping part of the tensile tester. Tensile tests were performed at a crosshead speed of 5 mm/min. The measurement was carried out for each nanofiber five times and the mean values were detected. 3- (4,5-Dimethylthiazol-2-yl)-2,5-diphenyltetrazolium bromide) (MTT) assay was performed to explore the cell viability quantitatively for GO/PLLA samples. MTT test was conducted for the cell culture after incubation on day 1, 3, 6 and 9. The sample number was five for each study group and medium without cells was used as a negative control group. On the test day, the old medium was aspirated and 200 µm fresh medium was added in to every single well and supplemented with 10% of culture medium and subsequently MTT assay was added. Finally, the 48 well tissue culture plates were incubated further 3.5 hours at 37 °C environment. After incubation, the culture of 100 µm solution was taken and transported into 96 well tissue culture plates to measure the intensity via a microplate reader (BIO-RAD Mark, Microplate Reader). The cell morphologies on PLLA and PLLA/GO nanofibers were analyzed by using SEM (Philips XL30 ESEM-FEG/ EDAX) at Boğaziçi University Research and Development Center Electron Microscopy and Microanalysis Unit. Specimens were first coated with a thin layer of 50 nm gold using a sputter coater and then the morphology of the SCs around the nanofibers were examined with an accelerating voltage of 5 kV. 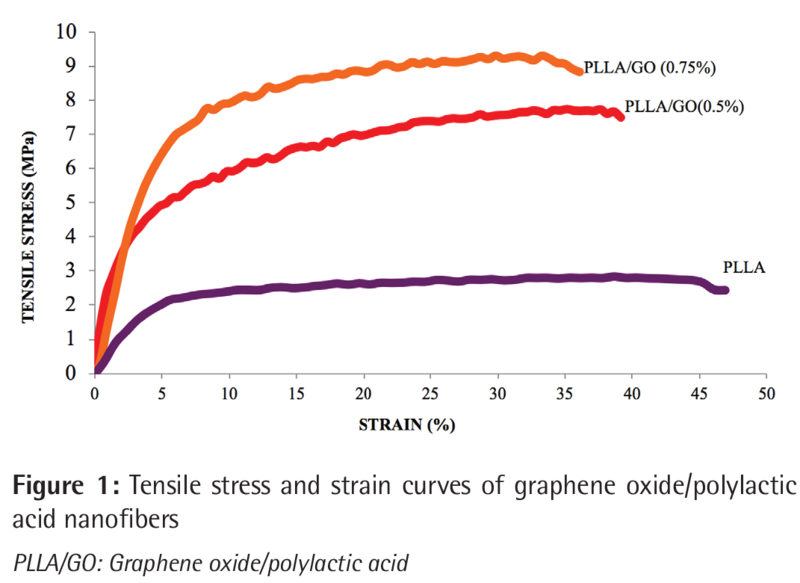 Figure 1 shows the stress-strain curves of PLLA and GO/PLLA nanofibers. The graph showed that increasing GO concentration in GO/PLLA composite nanofibers increased the strength and significant improvement in strength was observed with the addition of 0.75% GO. The ultimate tensile strength of PLLA and GO/PLLA were measured and it was seen that average tensile strength of the nanofibers increased gradually from 3.19 MPa to 10.44 MPa with the addition of 0.75% GO in pure PLLA. The Young’s Modulus and elongation at break results are tabulated in Table 1. Although there was no significant difference in elongation at break values of GO/PLLA nanofibers, average Young’s Modulus values increased from 66.47 MPa to 318.22 MPa with the addition of GO. The proliferation of SCs on PLLA/GO nanofibers after 1, 3, 6 and 9 days was investigated using MTT assay and all data were presented in Figure 2. 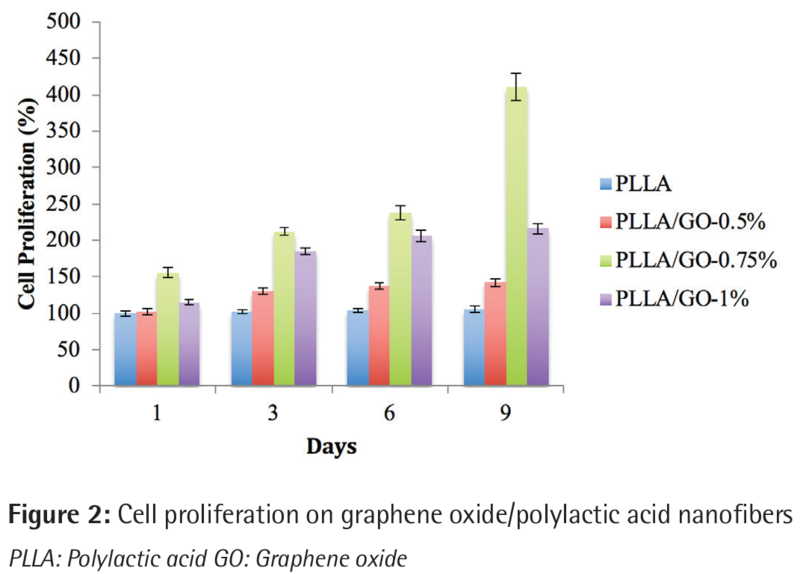 The proliferation of SCs on GO/PLLA nanofiber with 0.75 % GO concentration was higher than on the pure PLLA and GO/PLLA (with 0.5 or 1 % GO). Also, SCs proliferate on GO/PLLA with 1% GO better than on PLLA and GO/PLLA with 0.5% GO. The concentration of GO higher than 0.75 % contributed little on proliferation. The attachment and morphology of SCs on GO/PLLA nanofiber scaffolds with different GO concentrations was investigated after 24 h in vitro cell culture studies by using SEM. Figure 3 shows SEM micrograph of SCs that depicted the interaction of SCs with GO/PLLA nanofiber. 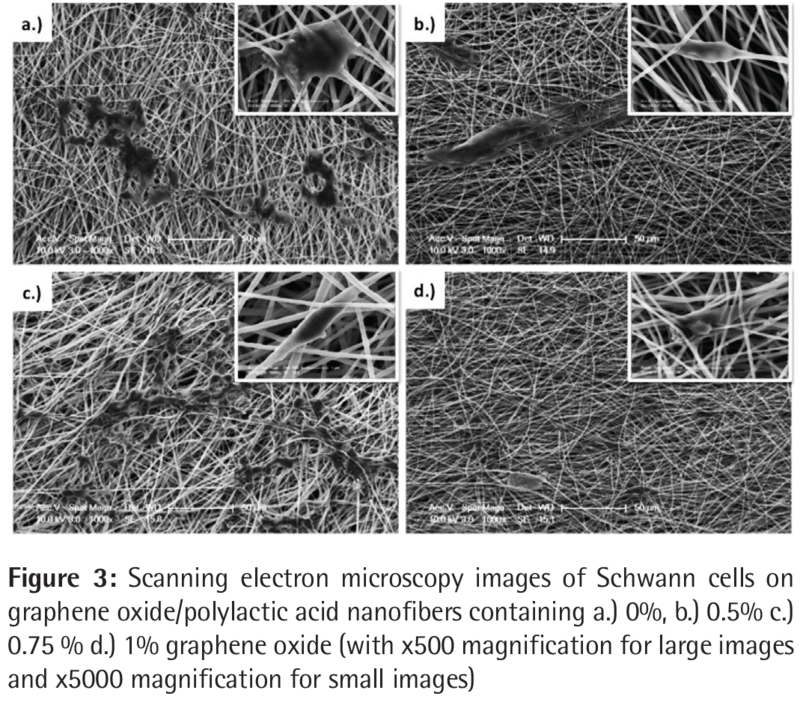 It was observed that SCs exhibited good interaction and integration with fibrous scaffolds but they have differential morphology as a function of composition of the nanofibers on which they grow. Tissue engineered scaffolds for nerve regeneration should mimic the biomechanical properties of peripheral nerve to support a three dimensional structure and cellular interactions. The peripheral nerves in situ are mainly exposed to tensile, shear and compressive stress (6). Therefore, in this study the tensile strength, the elongation at break and Young’s Modulus of the fabricated nanofiber scaffolds were investigated to design appropriate scaffold for potential peripheral nerve regeneration applications. The mechanical properties of PLLA and GO/PLLA nanofibers were investigated by tensile testing. The obtained results were close with the biomechanical values of peripheral nerve which has an average tensile strength of 11.7 MPa (4). Enhancement in the mechanical properties of the nanofibers with the addition of GO was provided by well dispersion of GO in the PLLA matrix leading to efficient transfer stress from PLLA matrix to GO sheets (7,8). Schwann cells (SC) are responsible of supporting and myelinating the nerve fibers as well as playing a unique and essential role in inducing nerve regeneration after nerve injury (9). In this study, the main approach was development of implantable nerve scaffolds that could support injured nerve fiber and guide SCs to repair and regenerate injured nerve (11). Therefore, the feasibility of GO/PLLA nanofibers for nerve regeneration was evaluated by conducting in vitro cell studies. The attachment and neurite outgrowth of cells on the scaffolds and proliferation of cells were critical parameters for assessment of the performance of the scaffolds that could be used as an implant. As the absorbance values strictly depend on the cell proliferation, the absorbance values were correlated to the proliferation of cells. MTT results demonstrated significant differences in proliferation of SCs on different GO/PLLA as a function of GO concentration. A higher proliferation of SCs on GO/PLLA nanofibers could be ascribed to increased biocompatibility of the scaffolds because of enhancement in chemical properties of the surfaces of the scaffolds with the addition of GO. Possibly, the presence of oxygen containing groups on GO increased the surface wettability of GO/PLLA nanofibers, and in turn improved cellular affinity (9). In addition to surface chemistry, surface topographical parameters also have influential effects on the cellular activity. As indicated in our previous study, the addition of GO decreased the nanofiber diameter and correspondingly decreased nanofiber diameter induced cell proliferation considerably (5). Christopherson et al. (10), also observed that the decrease of fiber diameter promoted the proliferation of neural cells. It could be hypothesized that a higher degree of proliferation could be attributed to the improvement of wettability and higher surface roughness of the fibrous scaffolds owing to the presence of GO in the nanofibers. Bipolar or tripolar morphology is typical for SCs, whereas flattened cell is indication of immaturation (8). On the nanofibers containing 1% and 0.75% GO, cells elongated and mostly attached along the fiber and SCs demonstrated typical spindle-like shape with bipolar extensions, whereas on pure PLLA and PLLA with 0.5% GO nanofibers, SCs appeared flat morphology. These cells not only adhered on the surface of nanofibrous scaffolds but also migrate inside the mesh structure. SCs appeared to have a typical bipolar, tripolar or flattened morphology. These results could be attributed to incorporation of the oxygen containing functional groups on PLLA/GO nanofibrous scaffolds with the addition of GO into the composite and possibly these functional groups favored the adhesion and maturation of SCs. Gupta et al. (12) observed similar morphologies of SCs on PCL and PCL/Gelatin nanofibrous scaffolds. SCs appeared bipolar on PCL/ gelatin nanofibrous while round and flat on PCL nanofibers (9). It could be deduced that all PLLA and GO/PLLA nanofibrous scaffolds supported the adhesion and typical phenotype of SCs. In this study, GO/PLLA nanofibers were prepared by electrospinning then their mechanical properties and biocompatibility were analyzed. The results confirmed that the addition of GO enhanced chemical, physical and mechanical properties of the nanofibers. The addition of 0.75% GO led to highest mechanical properties among the study groups. SCs also had higher proliferation on 0.75% GO/PLLA nanofibers. SCs on 0.75% GO/PLLA had an elongated bipolar morphology which indicated morphology of SCs. Therefore, the prepared scaffolds show promise for biomedical applications. Ethics Committee Approval: Since human or animal experiment have not been done in this study; ethical instution name, approval number and patient approval have not been received. Informed Consent: Since human or animal experiment have not been done in this study; ethical instution name, approval number and patient approval have not been received. Surgical and Medical Practices: H.Ö., D.E., Concept: H.Ö., D.E., Design: H.Ö., D.E., Data Collection or Processing: H.Ö., D.E., Analysis or Interpretation: H.Ö., D.E., Literature Search: H.Ö., D.E., Writing: H.Ö., D.E. Financial Disclosure: We thank to BAP (no:9940) for financial support to this study. Topp KS, Boyd BS. Structure and biomechanics of peripheral nerves: nerve responses to physical stresses and implications for physical therapist practice. Phys Ther. 2006;86:92-109. Cras P. Glial neurobiology. 2008. Öztatlı H, Ege D. Physical and Chemical Properties of Poly (l-lactic acid)/Graphene Oxide Nanofibers for Nerve Regeneration. MRS Adv. 2016:1291–1296. Jing X, Mi HY, Salick MR, et al. Turng, Preparation of thermoplastic polyurethane/graphene oxide composite scaffolds by thermally induced phase separation. Polym. Compos. 2014;35:1408–1417. Xu Y, Hong W, Bai H, et al. Strong and ductile poly(vinyl alcohol)/graphene oxide composite films with a layered structure, Carbon. 2009;47:3538–3543. MaduraT. Pathophysiology of Peripheral Nerve Injury. (2004) 1–10. Frostick SP, Yin Q, Kemp GJ. Schwann cells, neurotrophic factors, and peripheral nerve regeneration. Microsurgery. 1998;18:397-405. Subramanian A, Krishnan UM, Sethuraman S. Development of biomaterial scaffold for nerve tissue engineering: Biomaterial mediated neural regeneration. J Biomed Sci. 2009;16:108. Ma H, Su W, Tai Z, et al. Preparation and cytocompatibility of polylactic acid/hydroxyapatite/graphene oxide nanocomposite fibrous membrane. Chinese Sci Bull. 2012;57:3051–3058. Christopherson GT, Song H, Mao HQ. The influence of fiber diameter of electrospun substrates on neural stem cell differentiation and proliferation. Biomaterials. 2009;30:556-564. Brook GA, Lawrence JM, Raisman G. Morphology and migration of cultured schwann cells transplanted into the fimbria and hippocampus in adult rats. Glia. 1993;9:292-304. Gupta D, Venugopal J, Prabhakaran MP, et al. Aligned and random nanofibrous substrate for the in vitro culture of Schwann cells for neural tissue engineering. Acta Biomater. 2009;5:2560-2569.